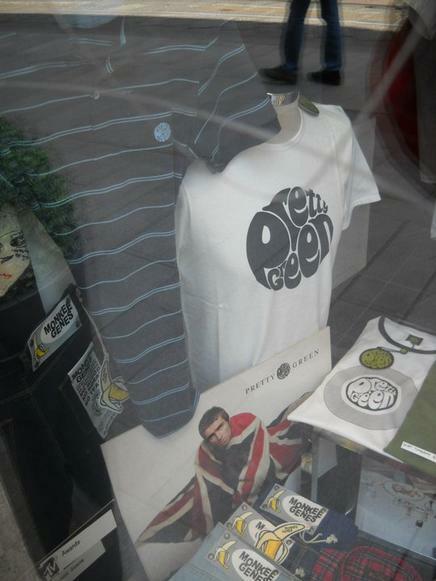 MILAN - Important step, Pretty Green began in Milan but as you can see, only recently arrived in the city of fashion and it's in the shops windows here in the centre. This one is very close to Saint George church, where I met Liam buying shoes in 1997. Meanwhile, following on from the huge success of the Carnaby Street store, Pretty Green launched its second London pop-up store in Covent Garden. Located in Covent Garden's iconic East Piazza, the new store houses both the Black and Green Label collections and features iconic imagery from Liam’s latest shoot for the SS 11 collection. Having opened to the public on Saturday 9th April, the store will be officially launched on Thursday 19th May by Liam Gallagher (same day of Dolce & Gabbana with AC players in a Milan shop, as when in July 2010 they opened the first PG shop and AC store the same day) with special guest DJs playing in-store at the exclusive event.